Poured from a can with no date stamp. Plenty of chocolate and cocoa and roasted malts. But there is a funky aspect as well, slightly tart like sour cherry (not sure if it is intentional in aging or a bad batch, as the label doesn't say anything about a sour/wild fermentation and other reviews don't mention it). Normal carbonation and medium body feel. Overall though, pleasant and interesting. I might try to find a fresher bottle to try again. L - Deep brown pour with a thick, 2-finger tan head. Good retention and lacing. S - Pretty distinct chocolate smell. T - Mild coffee/roast. Mild for a porter. F - Full mouthfeel. Smooth. O - Different from other porters I've had but nice, nonetheless. I liked the chocolate hints. A good beer. From 16oz can, extreme inappropriate carbonation ruined all 4 beers in the 4pk, must be bad batch? - regardless of glassware or pour technique there was 1/4 glass of beer 3/4 glass of head. Took a half hour for it to go down, naturally the taste was altered, very dissatisfied. It pours a dark black and gives a nice thick half inch foamy off-white head leaving some nice foamy lacing in rings. The smell has chocolate and malts up front coming forth roasty, smokey and robust. The taste is sweet with the chocolate and malts. The palate is smooth and creamy, thick and heavy. 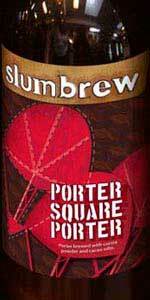 Overall, wow, what a great American Porter on a cold winter’s night that I would have again. Pours black with a tan foam. Cocoa, roasted malt, toffee and mild coffee nose. No surprises in the taste as it's loyal to the smell. Has both sweet and bitter notes that are pleasing to my palate. On tap at The Burren (during Irish music!). Really in the mood for a dark beer on a cold afternoon, and this hit the spot. Nice chocolate aroma and color with a caramel foam head. Good flavor profile with a nice feel for the style of beer. It is a nice one and done type of drink, good for an after dinner treat. Overall nice choice for a cocoa based porter.